The Baltimore resident, who we will identify only by the first name of Laura, decided to take photos of the inside of the van, and later posted them on Facebook. After the photos were brought to the attention of the Free Thought Project, we contacted Laura to verify their authenticity. “I want to contact the state’s attorney! I took these photos today! Around 12:15-12:30 TODAY! 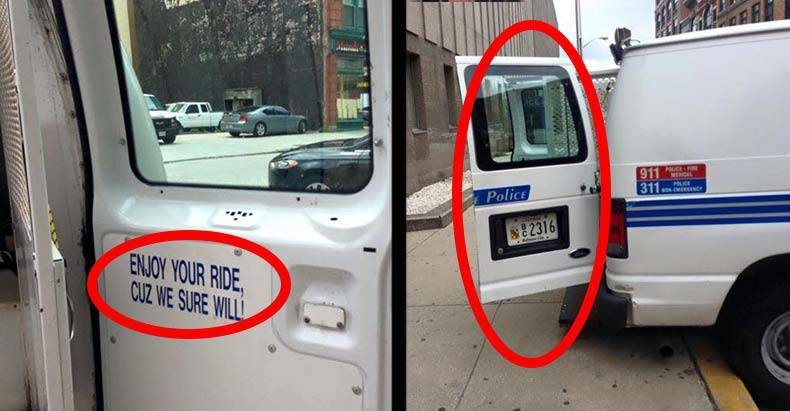 The paddy wagon was parked outside the police station with the door open. I didn’t get a picture of the inside, but it was meant for those arrested,” Laura said to the Free Thought Project. We also contacted former Baltimore Police Officer turned whistleblower Joe Crystal, who said that the photo does indeed seem authentic. “It could be real. That’s a picture outside of the central district which is connected to headquarters. The background (street view) is accurate so I think it can be true,” Crystal said. That same year, the death of Anthony Anderson was ruled a homicide, he too died of injuries sustained while riding in a police van. Of course, this year the brutal torture tactic took center stage in the case of Freddie Gray, which led to the highly publicized riots and protests that swept the city. One has to wonder, were those the last words read by Freddie Gray on his own death ride? Share this article with your friends and family to show them the sadistic nature of those who claim to Protect and Serve. Then call the Baltimore Police department and ask them why they are taunting and intimidating men and women who are innocent until proven guilty.